The winemaking tradition of the Brunel family dates back to the 17th century. Gaston Brunel, a famous négociant, acquired the Château de la Gardine in Châteauneuf du Pape in 1945. The estate is now run by his two sons, Patrick and Maxime with the help of their wives Eve and Maryse and their children Marie-Odile and Philippe. The estate spreads over 52 ha of vineyards (48 ha of red and 4 ha of white) and 20 ha of forests, all gathered around the property. The domaine is famous for the quality of their wines and for the unique Gardine bottle. Today around 70% of the production is exported in about 30 countries. When he first wanted to expand his cellar, while digging in the ground, Gaston Brunel found a mouth-blown bottle. He loved it and decided to use a similar shape for all his wine. At the beginning, he had to go all the way to Italy to find a glass supplier that was able to make it. 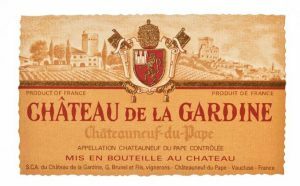 Since 1964 all our wines have been bottled in the unique La Gardine shaped-bottle.